So, I was considering the switch over to a different sport again... but hockey pulled me back! This was the last box of 12/13 Upper Deck Series 1 on the shelf at my local Target store so I decided to go ahead and give it a shot. There were a bunch of Score boxes... but I have been getting tired opening those up. 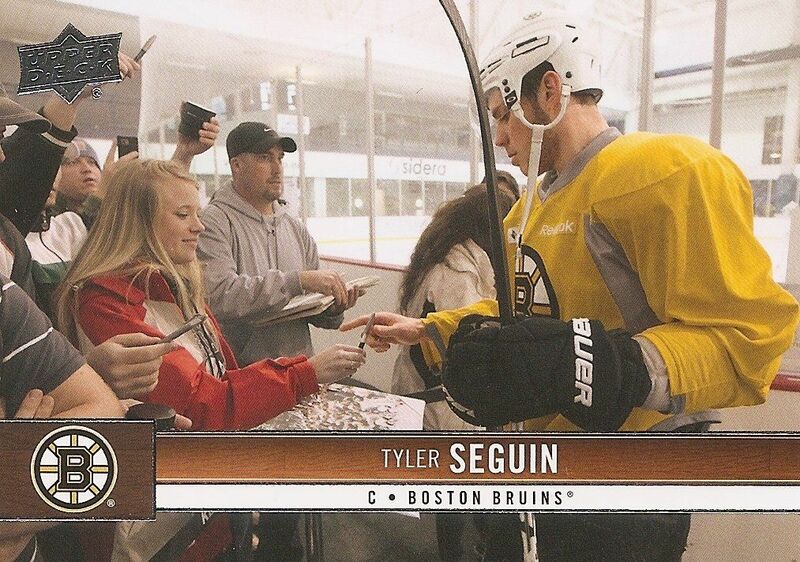 Upper Deck Series 1 is always a solid choice to buy at retail, so I felt good about this one. I'm not a huge fan of purchasing these blaster boxes at full retail price after getting so many at reduced prices from Dave and Adam's online site, but it was there and calling to me... so I went for it. It seems like Upper Deck Series 1 came out so long ago! And I guess it did. Usually by this time Series 2 would have been on the shelves available for purchase. But, because of the lock-out, Series 2 will not be available at retail. 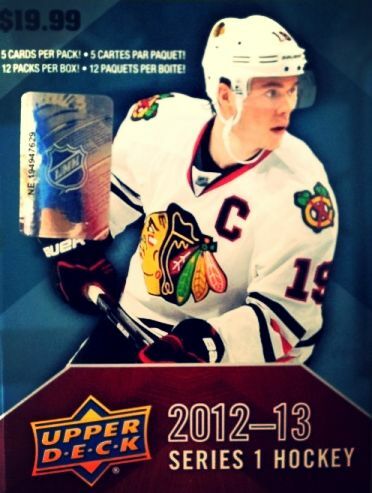 Instead, some Series 2 cards will be specially inserted into the Upper Deck's SP Authentic line. 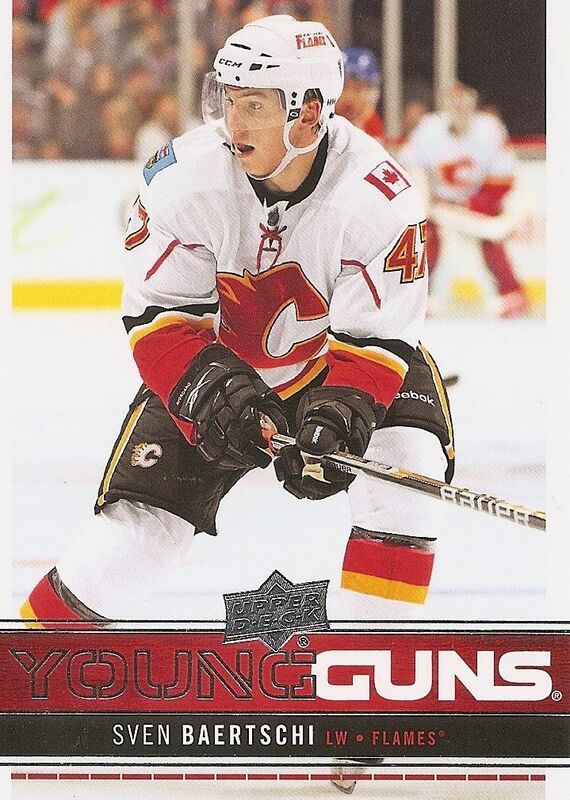 Most collectors know that the best Young Guns rookie cards are usually in Series 1. That is not the case here. The rookies are the hold-overs from the 11/12 season. There are some nice rookies to get in 12/13 UD1, but not on the levels of the past few seasons. There is always a hope that one of these rookies will make it big and be the next hottest thing, but there isn't that bonafide super-must-have-guy right off the get-go. That being said, though the rookie crop might be lacking, this year's UD1 design is as great as ever. The cards look amazing, and as usual there are unique photographs that are a hallmark of Upper Deck quality. Opening up this blaster was pretty fun. 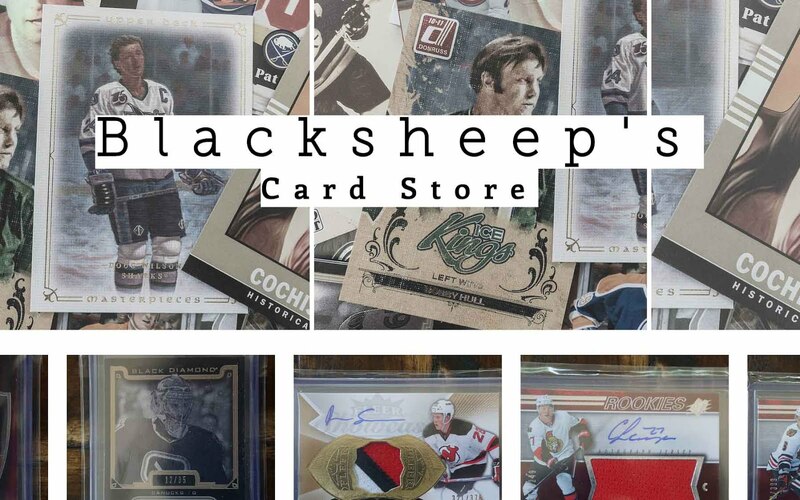 It's always nice to know that there will be quality in a blaster - whether it be nice rookie cards, good looking inserts, or just great photography. 12/13 Upper Deck blasters have all of that. Aside from the base cards, I pulled out two MVP base inserts, two Young Guns, a Decades 1970's card, and a Canvas card. I was pretty happy with most of what I got. The Canvas I pulled was of Michael Cammalleri. It's a pretty cool extremely close shot of him giving thumbs up. As impressive as the photographs on the base cards are, the Canvas ones seem to even up it a level. Bryan Trottier was my Decades insert card. I've stated before that I'm not a fan of these cards, the entire concept is a bit tired. How many more will there be? Will they go all the way to the 2000's and then stop? As for my Young Guns, both made me happy. One of them was the best card of the break while the other was a Sharks card - very pleased. For whatever reason I just love this shot of Seguin. He's out there signing autographs for fans. This is the kind of photo that captures cool moments that aren't on the ice. With so many cards in the set, it's great to have some pictures that look like this. With all the craziness Boston has been going through this week, I felt it would be nice to put this card in the top three. I'm not a fan of the MVP base inserts this year. 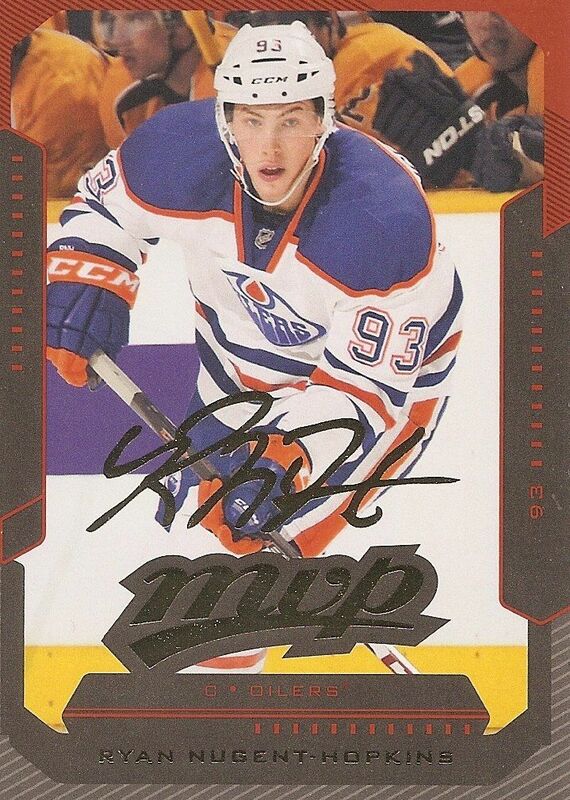 The color scheme is all wrong in my opinion, but pulling a Nuge is always exciting - even if it's a second year card. It actually still feels like his rookie year as the other big name rookies don't have official cards yet. Sven is such a cool name! Just for that this card should get top honors... but more than that, Baertschi is one of the hotter cards to pull out of this year's Series 1 Young Gun crop. It'll be interesting to see how Bartschi fares in Calgary. I certainly hope he does well! 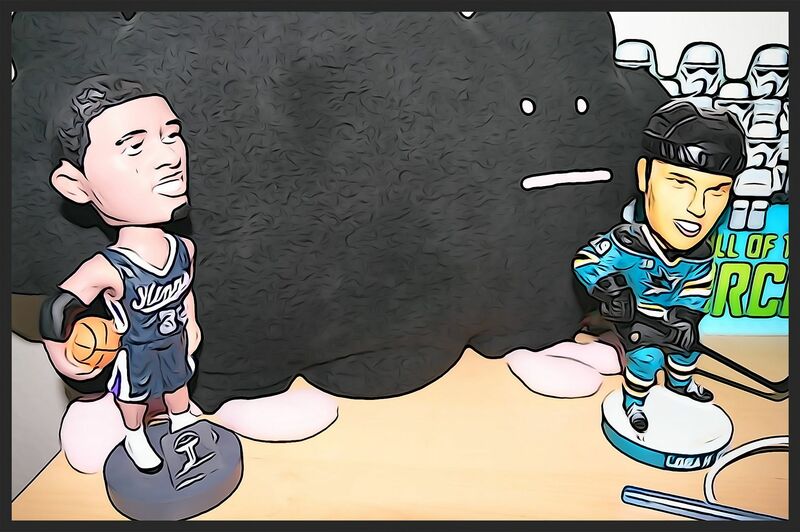 Will he step up with a team that has traded away its greatest player... or will he struggle without much support? Time will tell. Buying an Upper Deck Series 1 blaster is always a solid bet and a fun break. I wish that rather than including MVP base cards that there were other inserts (like the old All World Team cards) instead, but in the end it's not that big of a deal. 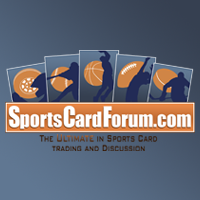 The cards look great and there can be value found in the rookie cards. Both new and seasoned collectors can find enjoyment going through one of these blasters. Let me know what you thought of my 12/13 Upper Deck Series 1 blaster down in the comments below. What have you gotten out of these? I'd love to know! Many people do not like this set but to be honest I like it. It is very cheap up where I am $15 to get a blaster box and $25 to get a tin. I have been collecting it since it was first released just like I do everyother UD Series 1 & 2 product. I feel if one of the rookies turns out big it could become a nice collection to have based on price to aquire. The Young Gun design this year is fantastic. I love the design and the way the lettering looks. It is very clean and flows great. Base cards match them as well which is something small I like. The MVP cards are nice. I would rather have those then the Victory Updates because atleast MVP is only the biggest names in the game. My only flaw of this product this year is the wrapers. They do not open well and something it can damage the cards if your not careful. Overall another great review and I am looking forward to the next one.